The Document features of PhotoUpLink let the user create PowerPoint presentations, Word documents or Zip archives of the images selected. PowerPoint presentations are created automatically for you, with one image per slide. The comments for that image from the iPhoto library are placed on the slide underneath the image. The images can then be resized and relocated, and the text modified and added to. To create a presentation, select PowerPoint as the document output format. It is required that you set an output location also before running. Click Select then choose the folder and name of the file to be created. Existing files cannot be overwritten, and adding the .ppt extension is not required here. PowerPoint will automatically open and create a new presentation with the images in it when you click Export. If you encounter any problems, try opening PowerPoint first then click Export again. Video and other file types are not supported. Word documents are created with one image per page. The title of the image is inserted as text at the top of the page. The image is then added, followed by the image comment from the iPhoto library at the bottom of the page. A hard page break is the inserted. This allows maximum flexibility for further editing of text, relocation and resizing of the image. 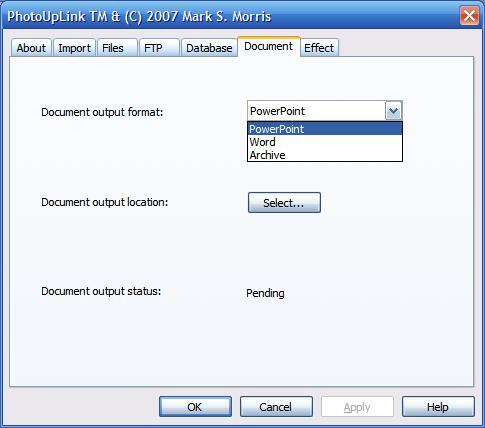 To create a document, select Word as the document output format. It is required that you set an output location also before running. Click Select then choose the folder and name of the file to be created. Existing files cannot be overwritten, and adding the .doc extension is not required. PowerPoint will automatically open and create a new presentation with the images in it when you click Export. If you encounter any problems, try opening Word first then click Export again. Video and other file types are not supported. Using a Zip archive, you can bundle a group of images and video into one convenient file. To create a Zip archive, select Archive as the document output format. It is required that you set an output location also before running. Click Select then choose the folder and name of the file to be created.